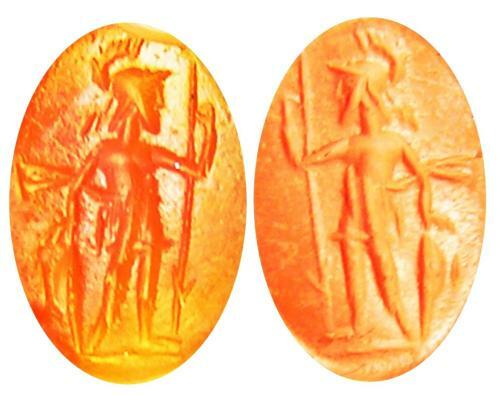 This is an ancient Roman carnelian intaglio, dating to the 2nd - 3rd century A.D. It is nicely cut with a depiction of Virtus standing in armor, resting on a shield and spear. Note the spear is upside down? this indicates a time of peace and rest. Virtus was a specific virtue in Ancient Rome. It carries connotations of valor, manliness, excellence, courage, character, and worth, perceived as masculine strengths (from Latin vir, "man"). It was thus a frequently stated virtue of Roman emperors and was personified as a deity—Virtus. In Roman mythology, Virtus was the deity of bravery and military strength, the personification of the Roman virtue of virtus. The Greek equivalent deity was Arete. The deity was identified with the Roman god Honos (personification of honour) and was often honoured together with him, such as in the Temple of Virtus and Honos at the Porta Capena in Rome itself. Such a gem would have once been set into a gold or silver military signet ring, used to seal and authenticate letters and dispatches, primarily by a centurion or an officer in the imperial Roman army. The subject being Virtus indicates the gem was awarded for bravery. Today this ancient gem has survived in good excavated condition, ideal to be reset into a gold signet ring or added to your collection.